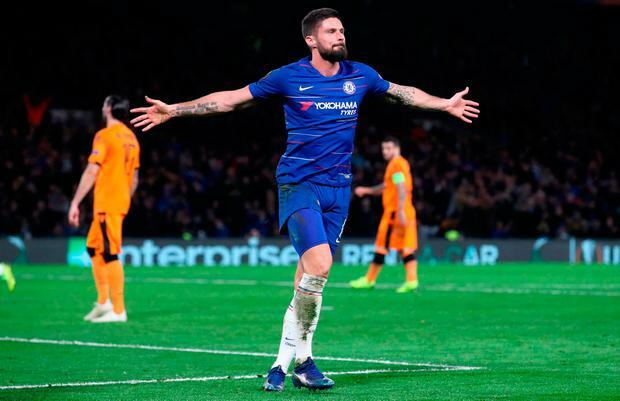 Olivier Giroud scored twice and Callum Hudson-Odoi netted his first goal for Chelsea as the Blues cruised to a 4-0 Europa League victory over 10-man PAOK Salonika at Stamford Bridge. Yevhen Khacheridi was sent off for the Greek visitors after just seven minutes and Olivier Giroud scored twice before half-time, the second a brilliant volley from a Cesc Fabregas pass. The 18-year-old Hudson-Odoi scored after 60 minutes before providing a goal for Alvaro Morata, on for Giroud, as the Blues responded from the loss to Tottenham with a fifth win from five European games. BATE Borisov's 2-0 win over Hungary's Vidi - Chelsea's final opponents on December 13 - in Belarus earlier on Thursday meant the Blues had achieved their goal of first place in Group L prior to kick-off. Sarri made 10 changes following last Saturday's loss to Spurs, after which the Italian questioned his players' determination following his first competitive defeat. N'Golo Kante was singled out for criticism, but was rested along with David Luiz, Antonio Rudiger and Cesar Azpilicueta. Eden Hazard was also absent. The Belgian is expected to shake off an ankle problem in time for Sunday's league fixture with Fulham. This presented an opportunity for those selected to press their first-team claims, particularly for Giroud. PAOK's bid to preserve their 100 per cent record in London - they beat Arsenal in 1997 and Tottenham in 2011 - suffered a telling, self-inflicted blow after only seven minutes. Right-back Leo Matos' pass towards Khacheridi was woefully inadequate and Giroud intercepted. The Ukrainian defender lunged desperately at the France striker, bringing him down at the edge of the area before being shown an inevitable red card. Fabregas sent the resulting free-kick under the wall, but wide. Giroud fired over after a lofted pass from Hudson-Odoi, who next had two chances. The teenager, starting for the first time this season, shot wide and then straight at goalkeeper Alexandros Paschalakis after twice cutting in from the left. Paschalakis turned a Loftus-Cheek effort around the post and Gary Cahill headed the following corner wide. PAOK's meek resistance was breached when Fabregas found Pedro, who in turn passed to Giroud. He bent the ball inside the far post with a first-time shot. Moments later Barkley laid the ball off for Hudson-Odoi, who took one touch to get the ball out of his feet and curled an effort onto the bar. Giroud finished exquisitely for his second and fourth goal in three Chelsea games. Fabregas clipped a perfectly weighted pass over the PAOK defence and Giroud volleyed in left-footed from six yards out. Giroud leapt in an effort to meet a corner, but landed awkwardly and hurt his ankle before continuing. A Loftus-Cheek run finished with a shot which was turned round the post before Hudson-Odoi, on the left, cut in on to his right and his shot beat Paschalakis at the near post. Morata replaced Giroud with 15 minutes remaining, with the Frenchman's ankle, and perhaps Fulham, in mind. Morata, sporting a fresh no-nonsense buzz cut, used his head to convert Hudson-Odoi's cross within three minutes of his introduction to wrap up a comfortable win.